In this episode, you will learn about America’s first wine trail from Cassandra Harrington, Executive Director of the Cayuga Lake Wine Trail. Cassandra has been director of the CLWT since December of 2014. In her time with the Trail, she and her coworker Kathy have completely rebranded the organization, increased event attendance and generated a solid social media presence. Cassandra has years of experience working in the tourism industry, having held positions at various wineries as well as the local Chamber of Commerce. When not working, she like likes to remain active by working out and traveling whenever and wherever possible. Thank you for joining me Cassandra. Thanks, Nicole, thanks for having me. I’m really excited to have you, and love that you’re involved with the Cayuga Lake Wine Trail because I’m sure you are going to bring such great perspective to our listeners today thinking about the wine industry, and how that intersects with travel and tourism. I can’t wait for our conversation. Before we get started, that background that I just read, while impressive, I know is only a small glimpse of who you are. I’m wondering if you could share a little bit more about your story with our listeners. Sure. My involvement with the wine industry actually dates all the way back to when I was just old enough to work. When I was 14, I walked to the only business within a block from my house, which was Knapp Winery, and started working as a dishwasher. I actually spent six years there, until, on a spring break from college, I ended up going over to Swedish Hill and taking a job there, and having then finished out my college degree at Cayuga College, got a business degree with marketing. After graduation, I worked at the Hillside Children’s Center admissions department. Soon after, I was able to get a job at the Seneca County Chamber of Commerce, and they’re also the tourism promotion agency for the county, so I was working in tourism. While I was there, with a lot of the wineries, Seneca County has one of the highest concentrations of wineries in the state, having the shorelines of Cayuga and Seneca in the county. While I was there I was also helping Toro Run get on their feet with their grand opening, and doing some marketing there. My father helped build a lot of the buildings that are onsite at Toro Run, and then when I heard of my predecessor’s retirement, I actually applied for the wine trail position and in December of 2014 I started here as the director, and have been loving life ever since. That’s really awesome. I love how you said as a 14-year old I walked to the closest business and that business was a winery. That’s what makes this Finger Lakes region of New York state so cool, I think. The winery where I started working at Knapp Winery was where my office is now. It’s kind of interesting, sometimes I take a wrong turn and I end up at the house where I grew up at, and I realize I was on my way to work. Whoops. That’s really great. I’m really looking forward to learning from you today and getting some perspective from the winery perspective, but also from all of your jobs and travels. We’ll get started. On this podcast, we like to focus in two areas, creativity and collaboration. A lot of times, especially in this industry it’s hard to talk about one without talking about the other because I do find they’re so intertwined. I imagine heading up a wine trail where you have several winery partners, it’s kind of the ultimate collaborative marketing effort, just by its very nature. I’m really looking forward to hearing your perspective. The first question really pertains to how you stand out from a crowd in such a competitive industry like tourism and hospitality. What have you done, or the Cayuga Lake Wine Trail to stand out from the crowd? Well actually, when I first started working here, one of the things, my goals, was to redo the logo. A new logo then turned into an entire conversation about rebranding the trail and figuring out exactly who we are and what made us different from our neighbors. Everybody makes award-winning wines, and everybody has great Rieslings, and that’s something that we as a region can pride ourselves in, but was it that necessarily separates Cayuga Lake Wine Trail from the other wine trails in the state? We are America’s first wine trail, we were founded in 1983, and since then the rest of the wine trails in the state have kind of taken on our business model and done something similar with their region. We wanted to make sure that we owned that because nobody else could say that. We are America’s first, and that’s our story. Now that’s in our new logo, and it’s carried on throughout all of our marketing materials, and it’s really been… It’s kind of been an awareness campaign for the customers as well who were not aware, even the people in our own backyard who didn’t know that we were America’s first wine trail. We took it and ran with it, and it’s been going great. I think that’s one thing that we did just to make ourselves stand out amongst the crowd. Yeah, that’s really awesome. First wine trail in 1983, so how many wineries got together at that time, do you know? It started out with five wineries. It was just after the Farm Winery Act was passed and a lot of the farmers around here were growing grapes and selling them to companies like Taylor, and when the farm winery act was passed, and they said that they could then sell wine direct to consumers, then the grape growing business became more of a wine making business, and instead of those five wineries all competing for the same customer, they decided to pull the resources together, form an organization, which was the Cayuga Lake Wine Trail, and then they had five times the marketing budget as they did with one winery and that’s how we got started. Wow, that’s really awesome, and I love the foresight of those five founding members to realize the importance of working together and collaboratively. We’ll talk about it a little bit more in this interview, but that’s what I call co-opetition with competitors come together to cooperate in order to do something bigger than what they can do on their own. That’s just really cool. I also like how you talked about the rebranding, how you started with we want a new logo, but it became this much longer maybe reflection or process. Can you talk a little bit about how you came to land on America’s first wine trail, and maybe a little bit about the process you went through to get there? Once we decided which advertising firm we were going to be working with on this project, which was Clark CSM, we had a brainstorming phase where we brought in as many of the board directors as we could, and sat around a table, and we had a big spreadsheet easel and we said, “Okay, what makes you different?” We had all these things up on the board, and when we were done, the objective was to come up with any and all adjectives that described Cayuga Lake Wine Trail. The exercise was to then put our neighbor trail in front of all those adjectives, and say, “Is this other wine trail this as well?” Yes was the answer to all but one thing, and that was the America’s first wine trail. Given America’s first and the history associated with it, we then realized too that it’s more than just having a logo, it’s an entire message that has to be communicated throughout all of your marketing materials, and it’s not just your logo, it’s the font, and the textures, and everything that goes along with it. The tone of the writing, and just always staying true to the brand, and consistent with the fact that we were the first, so you can count on Cayuga Lake Wine Trail for quality and the time that has gone into making that quality product because we’ve been doing it for so long. That’s great, and I think that’s interesting too, how you take America’s first wine trail, and then kind of transpose it into what does that mean to the consumer, and then kind of take that to a second level with your whole quality message. I think that’s really an interesting path. Should You Embrace Your Competition? I want to turn these questions a little bit to talk a little bit about, I find that we learn a lot from either challenges or adverse circumstance that we may find ourselves in. I always like to ask our guests one question that just talks about a challenging time and if you could think about a challenge, it doesn’t have to be a time in particular, but just a challenge that your organization faced, and then the impact that you experienced as a result of that. We usually find that really creative solutions come from those challenges. Do you have an example that you can share with us? Yeah, one thing that I know that we are as a trail dealing with, as an industry really, is the emergence and the success of additional craft beverages. We’ve been battling the fact that there are more breweries popping up, more cideries, more distilleries, and as America’s first wine trail, one of the things that we have been forced to determine is are we going to only be a wine trail and only offer wine to our customers, and somewhat corner ourselves in the market, or are we going to embrace these other craft beverages, welcome them with open arms, and offer them as kind of a fruit cocktail to our customers, as opposed to just being wine. That has been a challenge because there are many different viewpoints on the trail. We operate from a board of directors, and that board of directors is formed by one winery owner from each of our 16 member wineries. Some of those 16 member wineries are founding members of the wine trail. Again, being America’s first, we kind of have had this discussion to whether or not we’re going to uphold the wine trail wine being the operative word or embrace the others. Basically what it has come down to is we welcome our breweries and distillery partners as advertisers on the trail, they can come in and place an ad in our brochure on our mobile app, on our website, and it is something that we give as a referral to our customers over the phone, and then some of the member wineries, because they all are their own individual entities have taken is a step further and have added their own. We have four wineries that are also offering distilled products. I believe there’s three to five that have ciders. Then we have a winery that has beer on tap in their tasting room, and then another winery that has a tap room underneath their winery tasting room. We’re expanding in that respect, but at the same time we will remain America’s first wine trail and wine will be our primary offering, but we’re also supplementing it with other products because we know that not everyone only likes to drink wine. There’s plenty of options, and it’s better to offer the customer more of what they want. That’s really interesting, actually. One that I hadn’t thought of until you brought it up. This idea of the explosion of craft beverages in New York state, in the region surrounding you on the same lake that you represent, and how that impacts the wine trails and how you have to rethink what you represent, and how you serve not just your member wineries, but also your visiting public, your consumers. In addition to the wineries doing their own thing, one of our brand new promotions that we’re excited, so we just actually put a teaser out on social media the other day is called Cayuga cocktails. For the month of August, each of our wineries has a cocktail that they have put together using their wines, and maybe some fruit, or other distilled products of their own, or partners of ours. I know some people have partnered up with Meyer farm distillery, and they’re going to be offering these cocktails by the glass in the wineries for people to come and enjoy wine in the summertime. A lot of people might think that when it’s hot out a glass of cabernet sauvignon isn’t necessarily the best option, but there are also dry roses that are cold and pretty in a glass, but they’re still pleasing to a dryer pallet, then if you add some fruit or a spritzer to it, it makes a pretty cocktail and it’s fun. 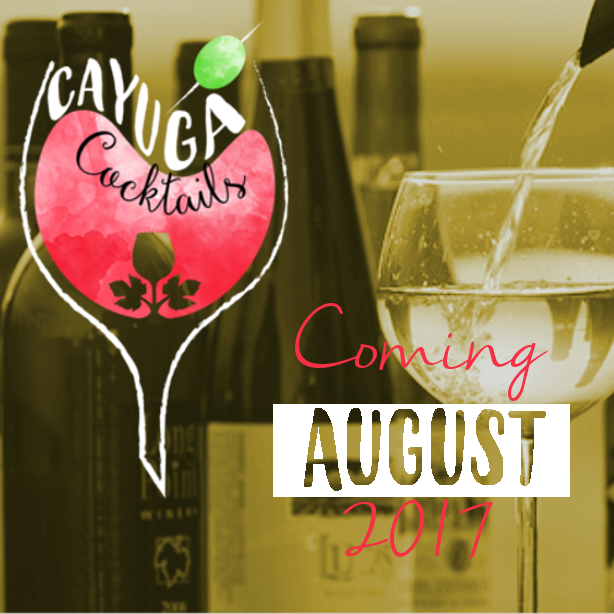 We’re making wine fun with Cayuga cocktails in the month of August on the Cayuga wine trail. That’s really awesome, and that’s a very creative way to think about that challenge and to embrace those other partners that aren’t wineries and to promote them, and then at the same time to draw the audiences into your wineries in the middle of August, I think that’s great. Love it. Looking into the future, is there a project that you’re working on that you’re really excited about that’s coming up? Yeah, actually really excited to announce a couple of them. We just had our first conversation after viewing our redesigned homepage for the brand new website we’ll be launching this summer, which will be far more user friendly and it’ll have a lot of pretty cool features, including a plan-your-trip itinerary builder, which will be awesome for those of you who might call the office hoping to help have someone planning your entire wine journey, you’ll be able to do it right on the website from your mobile phone or desktop, anything like that. It’s really cool. We’re super excited about a new website. Also to announce that this year is the 25th anniversary of our holiday shopping spree event, and to celebrate, we’re having an ugly sweater party theme this year, so everybody can wear their ugly sweater on the trail, and the ornaments will also be ugly sweaters. That’s super cool. 2018 marks the 35th anniversary of the trail, and we are in the very preliminary stages of planning a festival for September 2018, where you can taste and purchase all of Cayuga Lake Wine Trail wineries wine in one location without having to drive around the trail. Wow, that’s great. 35th year, that’s awesome, in 2018, that’s great. I can’t wait for that one. I know. You mentioned the website. I think that’s really interesting, and then you mentioned the plan your trip itinerary builder, and I think that really goes back to this whole idea of you’re more than just wineries getting together to market, but you’re also serving the visitors who are coming to your wine trail. Can you just talk a little bit more about how that itinerary builder came to be, or any of the other things on the website that are helping to support the experience versus just marketing? One of the things that we handle here in the office, we field a lot of phone calls from people who are trying to set up their own wine tour. For reasons behind access to different company’s reservation systems, we don’t have the ability to schedule people’s private bus tours, along with their accommodations and what not, but we can give them the tools to make their lives a little easier. One of the things that we’re doing, is providing them with a list of the wineries, and with the mini description of each, and if they choose that they want to go do these six wineries, they can choose them from a list, it’ll repopulate a new list, and of that smaller list of six they can then rearrange them in order in which they would like to visit, so maybe they want to go north to south, or south to north, or maybe they want to rearrange them a little bit to fit in lunch, and then go back and do another. They can do that. But what it will do because it will be Google maps integrated, will actually tell them the travel time in between those wineries. For somebody that’s not from the area, it might be better for them to realize that going from Montezuma Winery in Seneca Falls down to Six Mile Creek, which is almost an hour drive in Ithaca is probably not the best plan for a six-hour bus rental. That’ll be able to be a downloadable PDF or printed or emailed to them, it’s not specific, we don’t have it 100% nailed down yet. That will be available to the person who’s doing the planning and then they can share it with their group, they can share it with their driver, their transportation company will then know where they’re going, and it’ll give them a better sense of maybe they don’t need an eight hour rental, maybe they can get by with six or four. That I think is going to be a huge help for people. It’ll also improve the traffic flow from winery to winery. If they have a large group of say 15 or more, most of the wineries require you to make a reservation, and if you don’t know the travel time between them it’s difficult to set a reservation time for multiple wineries in the day when you don’t know that some wineries are right next to each other, and some wineries are an hour away from each other. Having that will be a huge help, I think, for the trip-planning customer and then for anybody who’s on that trip, it’ll be much more enjoyable for them as well. It’ll make things easier for the wineries and their staff members, and they can accurately plan who they need on staff. If they’ve got a group of 50 coming in at one, maybe they don’t need that extra staff person to come in until 12:30. It’ll help everybody out. That’s great. Thank you for walking us through that. I think it’s an important point. It’s not just about the marketing, it’s about the experience and the way you help visitors in addition to letting them know and building awareness, you’re actually helping the experience. I think that’s a great example. I’m going to switch gears again, and kind of move into a little bit about collaboration, although we’ve already talked about some collaborative projects that you’re working on. As I mentioned earlier, I’m just a huge believer in co-opetition, where competitors come together to create big wins, things that they can’t do on their own. It’s something that I find unique to the tourism industry where it’s everywhere. There’s so much collaboration going on, so I just love to learn from people like yourself and what you’re doing. Can you describe a time when you’ve seen a collaboration work really well? Yeah, well I mean that’s definitely the exact principle that our organization was founded on, and that’s how we continue to operate. Although I represent 16 wineries that are unique, and different, and must remain unique in order to stand out from their competitors, which are their neighbors, they still come together one day out of the month for a board meeting, and they all sit down with a common goal, and that is to increase visitation and sales, and provide an excellent customer experience regardless of whether or not they agree on the exact way to do that. I’m still in awe of how that happens in our organization level. We take it a bit further, and outside of just working with the wineries, we have a lot of partnerships with local accommodations as well. For our trail events, which are Mardi Gras, Beacon on the lake, and Wine and Herb, and Holiday shopping spree, we partner with accommodations in Waterloo, Seneca Falls, Auburn, and Ithaca, and anywhere in between and they provide us rates for the Friday and Saturday night events. We then couple the overnight rate with two tickets to our event, or a couple’s ticket, depending on which event it is, as well as transportation. We hire buses that will come from the north and the south, they pick everybody up who’s in our accommodations in Waterloo, Seneca Falls, and Auburn. They pick everybody up and drive them to Americana and work their way north, and at the end of the day they drop them back off at their hotels safely, and we do the same out of Ithaca. A bus goes down, picks up everybody up at the Ithaca accommodations, and then brings them up to the north end of the trail, works their way back south, drops them off at the end of the day safely as well. These take a lot of logistical planning and work to come up with the pricing and then the marketing for them but it’s something that the customer really appreciates, being able to come and do a one stop shop, purchase their ticket for one price, and not have to worry about all the planning that goes into something like this. They sell out, they’re one of the most popular things that we do throughout the year, and we were actually adding the rates for our holiday shopping spree event today to our website because we’ve had people asking about those rates now. We have to wait for the hotels to get their November and December numbers to us, so it’s cool how that all works out because we work well with everybody in the community. It’s not necessarily ticket price, it’s about providing the customer with that experience and the ease of purchase for something like that. Yeah, that’s so true, and I just think that’s a really awesome example, and I know that building packages is difficult, because you’re bringing so many different parties to the table, all who get a piece of that ticket price, if you will, or that package price. All that behind the scenes mechanics of it, I know can be really time-consuming, so I think that’s fantastic. Are those packages available through your website, through the hotel’s websites, how do you do that? Actually, they’re advertised through the website, but they have to be booked over the phone with us in the office, because Cathy then has to verify that the hotel has availabilities, so she calls and gets the confirmation number from them, and then continues with the sale with the customer. It’s very streamlined, and it’s quite a well-oiled machine at this point. That’s fabulous, so she’s almost like a concierge for that? Can you tell us where you look for great partnerships, and where you found those kinds of partners? Well, we have a different partnership too that I can talk about, it’s upcoming. It’s just been formed. One of the things that we often look for is the ideal customer, the people that we think best suit our demographics, and people who are interested in spending money. One of the newest partnerships that we have is with Waterloo Premium Outlets. On August 5th, it’s a Saturday, we are offering the first ever summer sip and shop sponsored by the Cayuga Lake Wine Trail. It is a three-day weekend, it’s a Canadian holiday, and so it’s one of the busiest weekends at Waterloo Premium Outlets, and there’s tons of shoppers. The wine trail is going to be set up there with tables located around the perimeter of the outlets, and people can purchase a glass for ten dollars, and the proceeds from that will be going to the Seneca County houses concern, and people can taste and purchase wine while they’re out shopping. Some people might need that while they’re out with back to school shopping and whatnot, a bottle of wine to go home. Yeah, that’s really cool. When did you say that was, in August? August 5th that’s awesome. I think that’s a fabulous idea. What better way to shop than with a glass of wine? How did that partnership come to be with Waterloo Premium Outlets? Can you talk a little bit more about that? Yeah, actually we’re always trying to come up with a way to share customers, and any business that’s located just off the freeway is one of those that’s easily accessible, and we’ve talked with people at the marketing department at Waterloo Premium Outlets for a couple of years about how we can get people from the outlets down to the wineries, and vice versa. This was actually one of their ideas, they came to us, and we put our heads together and worked out some kinks, and there’s a lot of times people come to us with partnership ideas, and sometimes they have unrealistic expectations of how it will work, and what is actually in the best interest of the wineries at hand. After a few long conversations, we came up with all the details, and we wanted to give back to the community so we tied it in with a charity, and it just kind of was born. It sounds great, I can’t wait to hear how that goes. You mentioned that people come to you with partnership ideas, and not all of them are a good fit. What kinds of things do you look at or evaluate when you’re considering a partnership. For the wine trail specifically, there’s a lot of opportunities for us to have exposure, but when it comes down to it there’s a lot of cost associated with partnerships, or events, or festivals, or anything that results just in exposure. The wineries have to pay for a staff member to be there to sell the product, somebody who’s knowledgeable of the product. They also have to get the products there and do the setup and the teardown. It’s a four hour commitment for something like this, because the event is four hours might end up being a six hour commitment for the winery, and that staff person, so most of the time they are going to want to be able to sell wine at these types of events so that they can see a profit. It has to be the right customer. If it’s an event that’s targeted towards… I’m trying to think of something that’s completely outlandish, but everybody drinks wine. A lot of people drink wine. I shouldn’t be general like that, but my first instinct was if it was a comic con or something like that. There’s an interest everywhere, but it’s just a matter of figuring out is it the right group of people that we want to target, do we think that it’s going to promote our bottom line or are people going to come back once they hear about us? That, and the communication with the proposed partner. I think communication is key in a partnership, and we have to be able to work well together in order to make something like this succeed. We also have to be willing, I think, to try new things, and that goes both ways. We have to be open to their ideas, but they have to hear our concerns and ideas as well. Right. That’s great. I want to just summarize, because I think you just gave us quite a few really great nuggets of information, and specifically when you were just talking about evaluating an opportunity and what you look for, kind of balancing the opportunity for exposure with the investment of resources, which may or may not mean money, but it could mean staff time or as you mentioned. Kind of just to make sure listeners didn’t miss these couple of points, but when it comes to the wineries, the opportunity for actual sales, the opportunity to encourage what we might call return visitation or visitation to the actual wine trail, and then I loved the point about aligning with your customer target. Who’s your target audience, and taking that into consideration? It sounds to me like if you know what you’re evaluating and what you’re looking for, that kind of doing some of this front end research, and looking at the opportunities from this perspective will give you a better opportunity to be successful. Would you agree with that? Yeah? I think that’s great. You actually started to talk about what goes into being a good partner, and I wanted to have to expand on that a little bit, but you started to talk about how communication is key, and being open to new ideas is also very important. Are there other things you can think of that set the groundwork for a successful partnership? I think maybe the only other thing that I would have to say is probably realistic expectations. Sometimes people come to us with ideas that are a little out there. People who are really interested in offering any of the wineries on our wine trail, and an additional tasting room facility that’s located just five miles from their current tasting room facility. I’m still baffled when you get that phone call all the time. Realistic expectations definitely has to be in there. I would take that example one step further, and instead of just thinking about what you’re looking for, what’s in it for me, think about the perspective of the person you’re making me ask to, right? Yeah. Sit in their shoes for a few minutes and think about what they might be interested in. I think that’s a really great idea. Cassandra, I really enjoyed our conversation, and you’ve shared a lot of information with us. There is one thing that we haven’t talked about yet, and that is your summer promotion, which I think is really creative and kind of goes along with the theme of somebody who loves to sip wine and shop, but is a little bit different. With the Bangles and Bottles, do you want to share with our listeners what that’s all about, and maybe about how you came up with idea, or is this a first-time event? This is actually the second year of our Bangles and Bottles, and the inception of Bangles and Bottles was kind of an interesting story. We had a promotions committee that gathers monthly on Tuesdays and we were talking about last summer, a way to get people to go to multiple wineries throughout the summer, and maybe collect some sort of token of sorts, and then because last year was the summer Olympics, we were talking about maybe doing some sort of tie in with the Olympics, but doing a twist on it to do with wine, and then we got to talking about pins and then pins morphed into jewelry, which turned into a Pandora bracelet and then we thought about Pandora bracelets and how they’re not as popular as the Alex and Ani style bracelets, charm bracelets, the bangles. What we ended up doing was creating a bangle for each of the 16 wineries, and for 65 dollars you get a ticket that folds in half into the size of a business card, goes right into your wallet, and you can take two months throughout the summer, this year it’s June and July, to visit all 16 member wineries on the trail, collect your bangle. You also get 5% off your wine purchases while you’re there. One winemaker picks a sample of wine at each winery that you visit, and once you have gone to all 16 and you have your 16 bangles, your ticket will be stamped 16 times, and you mail it back into the wine trail and you’ll be eligible for a grand prize drawing that we’ll pick at the end of the summer after the promotion is over. It’s pretty cool. We’ve had it sponsored by iHeartMedia and Binghamton, and we’ve had some great feedback on this. It’s been a way for people who love both jewelry and wine to enjoy both at the same time and we redesigned the bangles this year from last year, so anybody who did it last year can go again and get an entirely new set. Wow. That’s really great. I like how this came out of a promotions committee meeting. Can you talk a little bit about your promotions committee, and what their role is within your organization? Yeah, they play a huge role actually. The first Tuesday of every month we get together at Americana Vineyards. It’s two winery owners, and the rest are managers or marketing managers from some of the wineries that come, and we just toss around ideas. I put together a list full of opportunities that we have, news since last time, people who have called us with partnership ideas, or advertising opportunities, and I present them to the group and we hash it over, determine if it’s something that we want to be involved in, and then a lot of the Cayuga Cocktails, the Bangles and Bottles, all those things are results of the masterminds that sit at this promotions committee meetings. It’s one of my favorite hour, two hours of the month when we sit down and we come up with some crazy things. It’s fun. Like I said, Bangles started out from an Olympic pin, and then ended up as bangles. Those are fun brainstorming meetings to be in, to watch how one idea leads to the next. That’s really awesome. Cassandra, I’ve had a lot of fun talking to you today. I know our listeners will definitely learn a lot. Are there any parting thoughts that you would like to share before we sign off? Nope, I think that’s it. 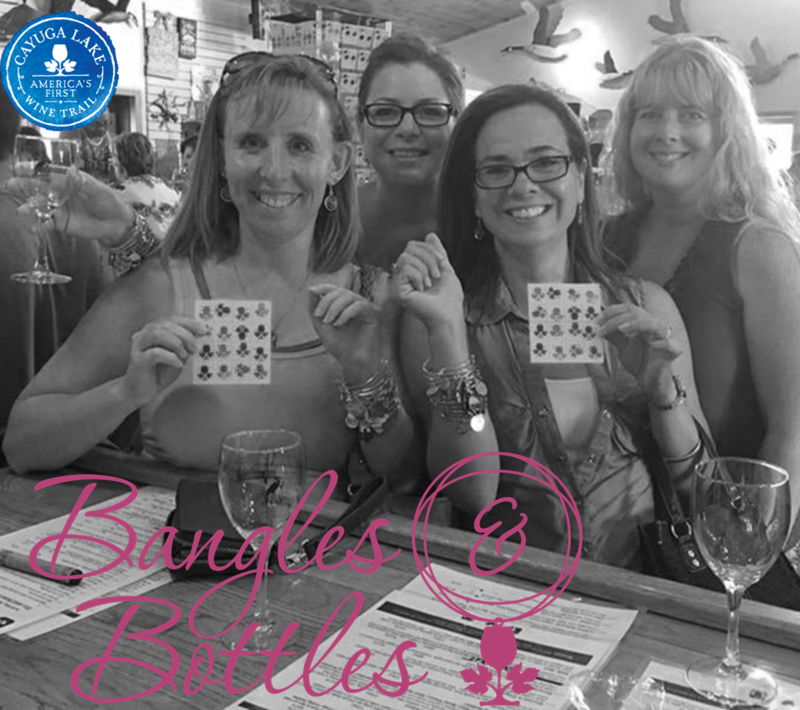 Bangles and Bottles is going on through the end of July, and as soon as that’s over Cayuga cocktails starts up and then we’ll be in harvest already. Wow. Wow, it’ll be here before we know it. Thank you very much for joining me, and I look forward to checking in with you again in the future. Thanks, Cassandra.